TAMPA, Fla. -- Giancarlo Stanton said he is prepared for the scrutiny he will attract during his first season with the New York Yankees. "The good times will be magnified and so will the bad," the slugger said Wednesday. "The fans expect a lot. I expect a lot too." Stanton won the National League MVP last year after leading the major leagues with 59 homers and 132 RBIs for the Miami Marlins. He was traded in December by Miami's new ownership group to the Yankees, a team that lost to theHouston Astrosin Game 7 of the American League Championship Series last year. New York opens this season at theToronto Blue Jayson March 29, then hosts theTampa Bay Raysstarting April 2. "It's going to be an exciting new year for me," Stanton said. "It's going to be exciting opening up both places -- New York and Toronto." Stanton enjoyed playing in New York while with the Marlins. "Baseball is No. 1," Stanton said. "New York is something special when you go there. Being in that city is a different feeling -- greatest city in the world." Stanton said he understands the Yankees' focus on accountability. "You've got to own up to your performance, to what you say, what you didn't say," Stanton said. "That's how it should be. I like it." Stanton, who turned 28 in November, is ready to take a leadership role when required. "There's things that the team needs to be addressed. 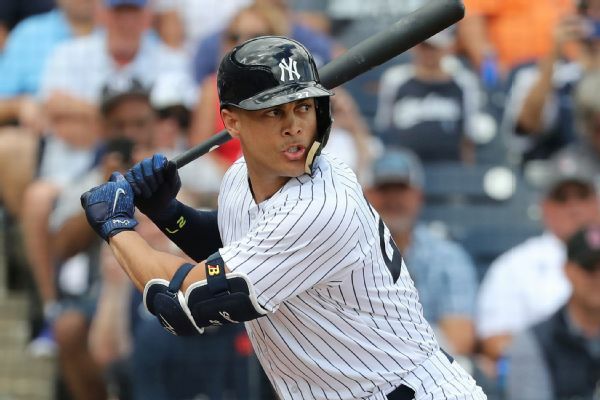 There's things one or two guys need to be addressed," Stanton said. "It depends on the situation. The situation presents itself, you handle it."